2941 has been one of my favorite restaurants for several years, and I was dismayed to learn that its imaginative young chef, Jonathan Krimm, had left last fall to seek out a new venue. I am pleased to report that the new chef, Bertrand Chemel, is putting his own delicious stamp on the place. A recent lunch menu presented me with the same happy dilemma that I always have at 2941: How do I choose among all of these intriguing options? Lunch offerings include a three-course prix fixe menu for $29.41. It was a bitterly cold day, so I chose to start with soup. The menu read "butternut squash soup, apple compote, ginger lime cream, lemongrass," and I wasn't sure what to expect from that. The bright yellow soup arrived in a shallow white bowl, looking for all the world like a sliced hard-boiled egg. At the bottom of the bowl was a gray emulsion that turned out to be the lemongrass. The combination was very fresh, and the soup had a lovely foamy texture. The menu listed the ingredients of my main course -- Nantucket Bay scallops, sweet potato puree, romaine hearts, bacon vinaigrette -- but the list doesn't do the dish justice. 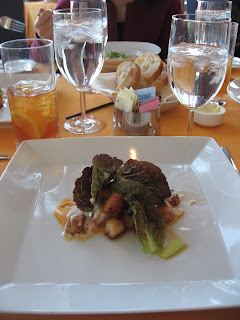 The scallops were luscious, and the red-tipped romaine added color and height to the plate. I finished my meal with a gratin of Bartlett pear. 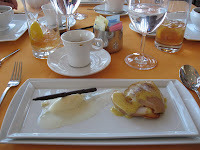 Tiny madeleines were a nice touch, but the best part of dessert was the spiced sabayon, flavored with anise. I wanted more of the mascarpone ice cream; the scoop on my plate would barely have filled the bowl of the demitasse spoon that came with my espresso. Service tends to be leisurely, at both lunch and dinner, but the dining room is a comfortable place to relax and look around. One wall of the double-height main room is floor-to-ceiling glass, looking out on a koi pond and a small lake. There's plenty to admire indoors as well: two fireplaces, an eclectic art collection, and light fixtures that resemble glowing, hovering orange jellyfish.